Went to see a client requiring a pair of eyelet curtains for a patio door which needs a good stack back past the frame work at least 26cm, with pole length being 240cm in total. I am dithering to either go for 1.5 fullness or 2 fullness any suggestions gratefull received. The fabric is Villa Nova Seville so it should fold neat. Julie, I always think that the most important consideration for eyelets is that they can just be pulled closed by any numpty and look good. Clients cannot cope with having to even out the folds - they won't bother (and why should they?). The way an eyelet curtain covers the pole is down to a combination of pole thickness and eyelet size. Does anyone have a table showing the amount of pole covered by one width of fabric with different sizes of pole and eyelet? That would be sooooooo useful. Seville is quite a thin fabric..... having said that we always work on 2 x fullness for eyelets I feel it gives a more luxurious look compared to 1.5 x fullness. I suppose it depends on the customer's budget. Both amounts are acceptable. Penny, how do you make sure that the folds are evenly spaced when the curtains are closed when using 2 x fullness? Do you insist on quite thick poles with the smallest eyelets you can get away with or do you put something on the back of the curtain to stop them being pulled too flat like those clips on some of the eyelet tapes? Obviously I know you don't use tapes but some do allow the curtain to be restrained and not pulled too flat. This is something I can never get my head around. Then there is the added complication if you want to eyelet to pattern. I need to make some new eyelet curtains for hubby's office and haven't dared start on them. I have a 28mm metal pole which is 180cm long, and loads of fabric - part widths can be accommodated. 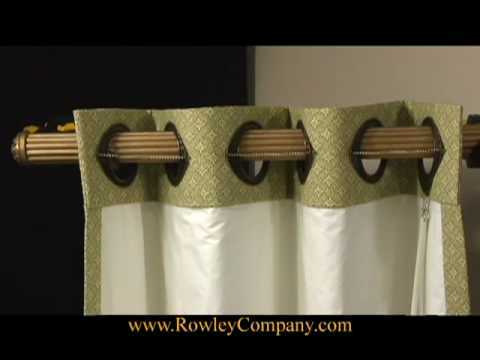 What size eyelets would you use and how wide would you make each finished curtain, and how many eyelets per curtain? It would be great to eyelet to pattern but it's not totally necessary and would probably complicate things further. The fabric is a velvet vertical stripe (Manuel Canovas Sienna - discontinued I think) but the stripes are not that wide. I always opt for 2x fullness. The best advice I can give is not to over complicate things! Make them to 2 x fullness and if your client doesn't want to dress them properly then that's up to them! 2x fullness gives you ample to draw across the window without looking too much of a flat panel that the 1.5x fullness width will give you. Make them , hang them, get paid, provide a good job/ service,take payment, skip to the bank pay in cheque, job done. Good point Tam - I think I must be over complicating. The funny thing is that the eyelet curtains that are up now are a damask pattern and one is upside down! Paul can't even tell - he thinks they are fine as they are and doesn't even want new ones so I guess he's hardly going to complain if they are not totally even across the pole. Just one problem though- I won't be getting paid! If you want the folds to fall evenly across the pole as you close the curtains, you'll need to hand sew spacing tape across the back between eyelets. It's time consuming but worth it. Use india tape, calculate the pole width and divide the tape by the eyelets and sew on. Otherwise you'll be dressing the curtains each time you close them as the majority of the fabric will remain staked at the side. What a great idea Philip. I have made quite a few sets of eyelets at 2x fullness & they looked good but did wonder how client would 'dress' them each time they were pulled. Thanks. Very clever Philip. I knew there would be a solution. I can get on with them now - safe in the knowledge that they won't be noticed, appreciated, or paid for, but at least I'll be happy. Maybe I dreamt this but , I do think Rowley supply eyelets with a bead chain which in effect does the same as india tape. I am not sure if there is a UK supplier of these eyelets though. Off to do a bit of research. Maz, I know how you feel, my hubby views curtains in much the same way! Its going to x 2 fullness, many thanks.